Electrical and electronic circuits are constantly bombarded with electromagnetic interference (EMI). A simple example of EMI is when someone plugs in a household appliance, such as a vacuum cleaner, and upon turning it on, noise is picked up by a nearby radio receiver. EMI filters are used to filter EMI interference, and can be sophisticated or simple. 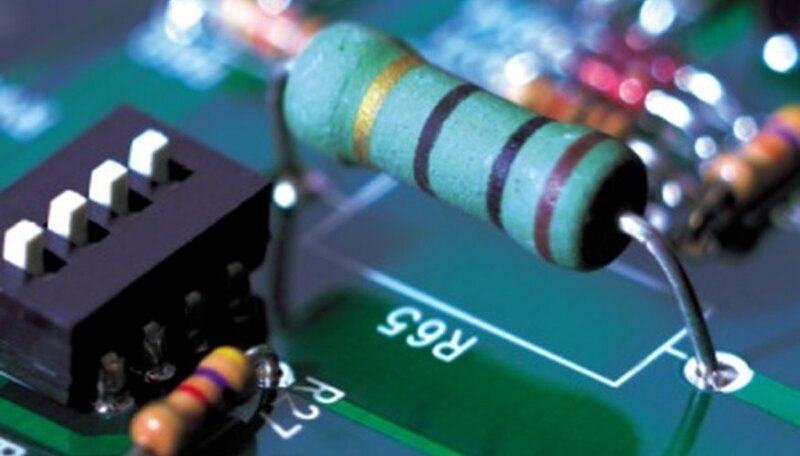 A simple EMI filter consist of a resistor, inductor and capacitor (RLC) circuit. The steps below outline how to calculate the R, L and C components of an EMI filter. Once these components are determined, the EMI filter can be constructed, installed and put into operation. Choose a power converter that will operate with the EMI filter. From the power converter specification, determine the operating input voltage range, output power, operating efficiency, switching frequency and conducted emissions limit. Calculate the resistor (R) component in the RLC filter circuit. Square the input voltage of the power converter and multiply the results by the operating efficiency of the power converter. Divide the results by the output power of the converter. The results will be the R in the RLC circuit in ohms. Determine the peak amplitude of the harmonic content associated with the input current. Multiply the input voltage of the power converter by the operating efficiency of the power converter. Divide the power converter output power by the result. The result will be the average current amplitude of the input pulse. Next, divide the average current by .50, or 50 percent. 50 percent is considered the worst case duty cycle of the input pulse. The result is the worst case peak amplitude of any possible EMI interference signal. Calculate the required attenuation for the EMI filter. For attenuation, you need an amplitude and frequency. To determine the attenuation amplitude, divide the peak amplitude you determined in the previous step by the conducted emission specification value defined in the first step. To determine the attenuation frequency or filter frequency, take the square root of the attenuation amplitude and then divide the switching frequency value you determined in the first step by the resulting number. Calculate the capacitor (C) component for the RLC filter circuit. Multiply the attenuation frequency by the input impedance. Then, multiply the results by 6.28. Next, divide the results into 1. The resultant number will be the value of the capacitor component of the RLC in units of farads. Calculate the inductor (L) component for the RLC filter circuit. Multiply the attenuation frequency by 6.28. Divide the resulting number into the R value you previously determined. The results will be the value of the inductor component of the RLC circuit in units of henrys. Chestnut, Dwight. "How to Design an EMI Filter." Sciencing, https://sciencing.com/how-7935666-design-emi-filter.html. 07 August 2017.